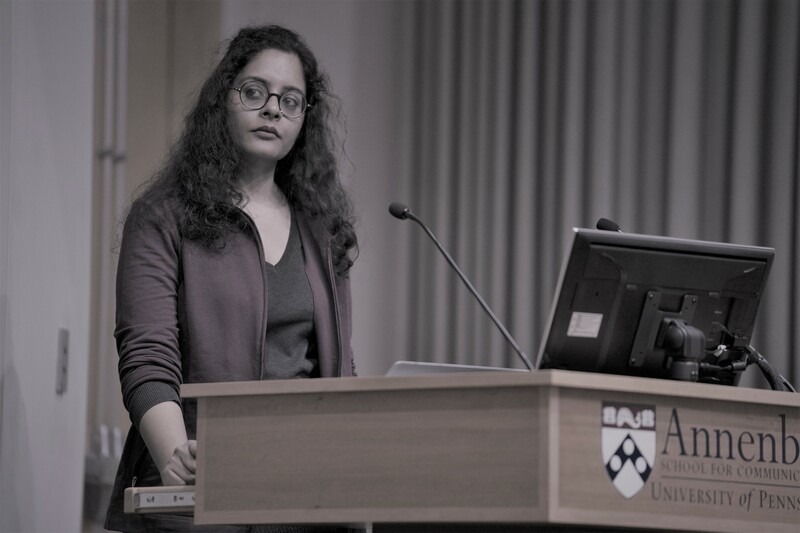 The following transcript is from Shalini Singh’s lecture hosted by the Center for Media at Risk and co-sponsored by the Center for the Advanced Study of India (CASI). She spoke on February 14 at the Annenberg School for Communication, University of Pennsylvania. Some basic facts about India first. India is the second most populous nation after China. It is one third the size of the U.S. and three times the people. It is the land in which Mahatma Gandhi launched the nonviolent movement that culminated in the end of the 200-year-old British rule in India. We also gave the world chess, zero and yoga. We’re the world’s largest and youngest democracy. A former Indian professor formerly at the Harvard Kennedy School has also called us the most improbable democracy given the sheer diversity that exists in the country. There are 22 official languages, but more than 800 exist. There are about 10 major religions, and over two thirds of Indians still live in rural areas. English, one of the official languages, is spoken by 10 percent of the population. India is also a hugely unequal society. In the year 2000, the top 1 percent of Indians held nearly 40 percent of the country’s household wealth. In 2016, that figure went up by 20 percent, and so in 2016 almost 60 percent of India’s top 1 percent held a majority of the country’s wealth, and in comparison to the counterparts in the U.S. whose share was a little over 40 percent. It basically means in that year the top 1 percent of Indians held a greater share of wealth within our nation than the top 1 percent of Americans ever did within their own. These figures are according to Credit Suisse Global Wealth Databook. For the same years, in 2000, India had 9 billionaires and in 2016 there were 101. Women’s safety has been another issue, where over 70 percent of women are said to have reported abuse or violence of some kind. I’ve been one of them. I began my journalism career in 2006 for a news magazine that took a clear left-of-center position. The first story I did was on the child football makers of Meerut, a small town near New Delhi, which is the capital of India, at a time when the World Cup was on. I traveled with my photographer colleague and local activists to document the plight of these children who spent hours hunched up stitching footballs for a living. When I returned home the same evening, my friends had made a plan to visit a local pub, knock back some beer, watch the match, and I was thinking about how I would write my piece that was due the next day. I wanted to do it in a manner that wasn’t preachy and I didn’t want to be labeled as a bleeding heart storyteller. I wanted that anyone who read it could relate to it in some manner, feel a sense of empathy. When our bill came for the beer that we had had, the amount was exactly how much this family that I had met was earning in one month stitching footballs. That’s how the idea struck me to link those two very diverse realities and begin my story. This is the story that I almost did not do, and it turned out to win all the top awards in Indian journalism, India. From 2008 onwards I had started working with one of India’s top English-language dailies, The Hindustan Times, and in 2010 I went on an environment fellowship in Goa, which is India’s smallest state and a popular tourist destination. I was researching land development and this was in terms of how the people from the mega-metros of Mumbai and Delhi were buying up holiday homes or investing in real estate in this tiny coastal state of India. That tussle was leading to resource wars between the local population and the people from the cities. My work was over, and I was hanging around one day in Goa’s capital with some local journalists and I saw this big group of people protesting outside the chief minister’s office. Curiosity pulled me in and I extended my stay. Digging deeper into the issue as the protests grew louder, I made friends with an academic who put me in touch with a local activist. We journeyed to his home in the jungles where I lived with a tribal family for two days. Electricity would go off at sunset, and we were surrounded by wild animals. I even got my period and climbing up and down the high mining trucks was tough, and you are like, “What do I do?” You can’t miss out on the story at any cost. I came back to Delhi and I interviewed the mining companies, pushing the story right up to the ministerial levels. Once the story was out, a policy impact happened: a moratorium on mining activities in the state. The interesting thing was that I am a featured writer who ended up with an investigative story. Stereotypically speaking, I was the patient, mild, long-form culture reporter, not the quintessential hard-hitting investigative kind, but this showed me that your next story could come from anywhere and the idea is to just look out for them. I live in a mainstream neighborhood in India’s capital, which is Delhi, but just three miles from me lived this woman whose story the editor wanted me to tell; the woman was a survivor of an acid attack. We spoke for over two hours, and while telling me about her ordeal she broke down and started to cry. She couldn’t cry because she had no eyes. She couldn’t even express her emotions naturally. I cried because I felt her pain, but she couldn’t, and that hit me. She kept repeating how badly she wanted to heal and lead a normal life again. I had to write the story in a first-person format in her voice, and the theme that struck me was one of great courage. When the story was published, help and aid poured in for her. I remember she called me a few times and said how people had sent in money and jars of aloe vera creams post her operations and the different surgeries that she had to have. She even got a job at the courthouse that she would keep visiting to fight her case. She thanked me and I told her I was just doing my job and it was her conviction that led to her healing. What this taught me was that we think of heroes as people as on some kind of a pedestal, propped up by the mainstream, but there are several of those who just live quietly amongst us. Five days, seven states, 600-plus stations and one train. My photographer and I, we lived without taking a shower for almost a week as we traveled on India’s longest train ride. The challenge was distilling an entire notebook into a 3,000-word cover story that had to capture sights and sounds and smells and interviews. The thing that struck me most about this adventure was that the stark inequality of India could be seen on one train. The privileged ones who could afford it occupied individual compartments, and those who couldn’t had to cram into coaches that were filled 10 times the capacity. This included young women, babies, laborers, teachers, students, without proper facilities or food. According to my very generous managing editor then, the story became a national talking point. I even got a gift from a middle-aged government official who gifted me a calendar saying the story reminded him of a well-known travel writer, Paul Theroux, who I had never read in my life. This was the first time I had a direct warm connection with a reader who still calls me once a year to rant about life. Personally, this was a special story because I later discovered that my grandfather, who was a well-known science writer, had written a children’s book on the story of the Indian railways way back in 1971. Last year, I was asked by an Indian historian if I wanted to be part of a book with five other writers from across the world. Who says no to that? In 2016, Canadian activist writer Naomi Klein had delivered a lecture that examined the idea of othering and the larger picture of those who get sacrificed in the outcome of development. In my essay for this book, I connected the dots between the demonetization fiasco in 2016 in India and my earlier work on environment issues. And that’s a nod to my favorite cartoonist, Bill Watterson, who survived his art without selling out. Over the last decade that I’ve been a professional journalist, I’ve often wondered that despite coming from a certain space of privilege, why do I feel compelled to tell the stories of those who often don’t get a voice? I found resonance in the explanation of my teacher and well-known journalist, P. Sainath, who says that justice should matter to everyone and not just those who suffer injustice. As journalists, we chronicle the present that would in some way inform the future. It feels like a huge responsibility. That perspective brings me to tell you about the People’s Archive of Rural India, or PARI as we call it for short. In most mainstream media everywhere today, 80 percent of the debate in any country is about the issues concerning 20 percent of the people. If you look at both America and India, it’s the same. How can people like us try to make a difference? Well, by focusing on issues that the majority of the people face. In India, this would be over 800 million people in the rural areas. Possibly the counterparts of those living in what is called this flyover country in the U.S. In 2014, a bunch of us joined well-known journalist Sainath, to start the People’s Archive of Rural India. PARI is an online digital archive that tells journalistic stories about the lives, livelihoods, languages of rural Indians. Our aim is to situate a reporter on every one of the 100 historical regions of India and cover the country. That coverage would be in the form of articles, photos, videos, films, by people who are not necessarily all professional journalists but often ordinary citizens, including a rural person himself or herself, who some of us work with to help them tell their own stories. In a way, the journalist becomes the medium as opposed to the storyteller. Let’s take a short tour of this archive here. The homepage changes with a crop of new stories as they come up. Right now there’s reportage on Aadhaar from different rural districts. Aadhaar is the 12-digit unique ID issued to citizens, the Indian equivalent of the American social security number, but it has been controversial in terms of being seen as a surveillance engine by the government. Similarly, with the demonetization move in 2016, where overnight two currency notes of 500 and 1,000 were declared to be no longer legal tender. PARI sent out a handful of reporters to see how this move affected those most dependent on cash, which are people in the countryside. These government policies impact all citizens. The mainstream media focused on urban folk, who are a minority in our country, and I’m not saying they’re not important or shouldn’t be talked about. The problem is with the disproportionate coverage and none of them are part of the majority. According to the Delhi-based Center for Media Studies, 67 percent of the front page of the national dailies in 2014 and ’15 came only from New Delhi. Between 2012 and 2016, front-page space given to stories from India’s 640,000 villages was 0.26 percent. It’s never more than 1 percent for nearly 70 percent of Indians who live in rural India. Most stories in People’s Archive fall under more than one category. Some of these categories are “things we do,” which look at the world of rural labor, or “things we make,” which are artisans, artists, craftsperson, rural handicrafts. There’s “farming and its crisis”: the troubled world of agriculture. There are also “little takes”: small, impactful video clips. “The rural in the urban” looks at migrations, at people moving from rural to urban areas and how their lives pan out. “Women” is a separate category, as is “Adivasis.” “Dalits” looks at the struggles of the most oppressed communities and cultures in society. “Resource conflicts” looks at stories of the environment and other resource wars. “Foot-soldiers of freedom” maps India’s last surviving set of freedom fighters. There’s a category for children, rural transport, “rural sports,” “healthcare,” and there’s a whole category on languages and “one-offs” and other things. One of the unique projects of PARI is the FACES project. It’s an effort to capture the country’s facial diversity by photographing at least three people–one adult male, one adult female and one child or adolescent–from each administrative region of India. As a counter to the selfie culture,young people who are highly active on their mobiles are encouraged to go out, take photographs with the subject’s informed consent and talk to them. When they provide data about the subject’s name, region, and occupation along with the photos, the exercise compels them to engage with people from a different background. The FACES project is a PARI USP, and through it the idea is to explore India’s astonishing diversity at another level by recording the facial appearance of ordinary Indians. I think we have probably over a thousand photographs already. People’s Archive is not just available in English. There are nearly 15 Indian languages that you can find on a single article, though not all of them. It depends on the volunteer translator. For instance, if I read an article on PARI that I like and I also speak a different Indian language, I can offer to translate that article. Interestingly, Urdu is the second most translated language on PARI after English. Sometimes the same stories that are on this page would be in English as well as Assamese, Bengali, Hindi, etc, so they’re accessible to whomever is interested in these issues. Last year before coming to Cambridge, I traveled with a senior editor from People’s Archive to a northern state in India called Ladakh, where I mentored a young woman on how to report like a journalist. It was the first time that I was helping shape someone’s ideas that would become stories. This is one of the pieces she did which is on a market run totally by women in Kargil, which is the site of the India-Pakistan War in 1999. We traveled in this market together, and later she pulled this story from our experiences. We discussed the points she could highlight. Overall, it was a fabulous experience. I’m going to show you a short video of the founder editor who tells us in further detail about PARI and how we go about what we do. We’ve been hearing about the #MeToo movement in the U.S. and elsewhere After my own presentation at the Nieman Foundation in November, which recounted why I do what I do, our curator asked me what it was like covering gender issues in India while witnessing what’s happening in the U.S.
To that point, I’m going to end my presentation with a short video that’s part of another unique project called the Grindmill Songs project, which is headed by our managing editor who comes from a non-journalistic background. This shows the exploration of a cultural space of a very poor woman in rural Maharashtra. In doing that, it reveals to us the complexity and diversity that lie within the issues that might be common to women across the world.